I don’t know that the tragic events of today are even related to a Muslim nor do I have a sense that it was a terrorist attack at this stage (it certainly has all the hallmarks). Yet, this Imam seems somehow convinced and offers his solution. The one thing I will say about him, is that he comes across as very sincere. This is an incredible log of a world-wide journey, published in 1925. Even the City of Melbourne was visited and described in Chapter 7, and I present that section below (not perfectly converted from PDF to text). than that of their co—religionists in the mother country. either open or close with a similar patriotic manifestation. of the society for the benefit of the Palestine Fund. by the acquisition of the loaf of the Zionist Emissary. indeed been looking forward for some time to my coming. me upon having got off so cheaply. the Jewish colonization of the country. “ Who was that ? ” I asked curiously. “ The ‘historian of our people, Graetz,” was the reply. some of my friends were rather nervous about the result. his waistcoat-pocket, he said : “ This is from my cook. to visits paid to Geelong and Ballarat. Another distinguished Jew whom I met was the Hon. had evoked encomiums from legal authorities in England. the highest position by sheer merit and force of character. having no such qualification, could claim nationality. that he confused nationality with citizenship. asking for the equivalents of various modern terms. ideas, still less for the gathering of new impressions. and signed by me as President of the Society. were in no case exciting, though occasionally exasperating. promise a donation without some preliminary skirmish. of a Job and the ingenuity of a counsel for the defence. we Jews have not had enough with the wars of others. had lived in Palestine several years before the war. Melbourne Jews, and had proved thoroughly successful. and the ‘explosion of his thesis. with the Commonwealth “Premier, the Right I-Ion. is invariably styled, address the House on the Estimates. with his arresting eye and air of authority. [for his private room, into which I was presently ushered. and then asked if he could be of any assistance to me. I was in Melbourne, and I had to leave for Sydney the next day, that desire was doomed to disappointment. “Because we can’t spare any,” he added grimly. He expressed his good wishes for the continuance of my tour, and I withdrew. It is well worth downloading and reading all 378 pages of this book. Enjoy. In some ways, this part of the trip afforded me with a most significant lesson in morality and middos. On Friday night we were fortunate to be invited to a family home of the Chosson. The host is well-known to me as a fellow graduate of Yeshivah College in Melbourne. The hostess is a more recent person who I met in Melbourne a few times, and is somewhat more “reserved” but charming. I know many of their children, and with one of the husbands discussed his PhD, and if I can, I am hopeful to help him achieve some of dreams flowing from those ideas. He and his wife represent the essence of values that makes Chabad an attractive proposition to those who are searching and attuned to the spiritual. At subsequent Sheva Brachos my wife also discovered a common educational language. I was thrilled with that outcome. The Dinner proceeded, and whilst I had been asked to pop in and meet the well-known Rebbetzin Henya Lane (a sister of my Mechuteniste) after Friday Night dinner, that didn’t happen because Friday night’s dinner ended late, partially due to wonderful hostessing and the happy, relaxed ambience. By that stage I wasn’t about to barge into someone’s house late on a Friday Night. Henya’s husband is also related to Avremy Raskin (who isn’t? ), and is in need of a Refuah Shelema, since then. I understand he is on the mend, Boruch Hashem, but I don’t think I formally met him. My feeling is that he will return to full activity and vigour, and for whatever my Brocho is worth, R’ Chaim Dovid has it. The “morning after” was Shabbos and it was time to go to Shule. Again, the combination of a windowless basement, remnants of jet lag, no alarm clock, and good food and drink the night before conspired to make me late to Shule. I’ve never been one to come late to Shule; I abhor it! I have to admit that on this occasion when I arrived at 770 for the aufruf upstairs, I felt thoroughly ashamed of myself for being late. The Aufruf was upstairs in the Yechidus room; the room where I felt very comfortable, and I again met some wonderful Talmidei Chachomim, including Rav Michoel Seligsohn, with whom I discussed various issues, and stay in touch. He is a very quick to respond, and I appreciate his perspicacity and learning. I had wanted to meet R’ Chaim Serebryanski who davens downstairs, and asked someone to see if he was there, but learned later that he finishes his seder learning and davening, early. As davening came to a close, I initiated the process of remembering where my overcoat and hat were placed and thank God, I was still on the ball and found them. This is another weakness of mine. I’m prone to losing things. To many this is trivial. For me, it’s a major challenge. I still got lost merely negotiating the upper floor. As I picked up my hat, I noticed the venerable Rav Yoel Kahn שליט’’א giving a shiur in Chassidus to the Bochurim of Tomchei Temimim. I felt I should experience this, as he is considered the doyen. Unfortunately, a combination of his accent, and compromised health, meant that from the distance, there was little chance for me to understand what he was saying. I waited for a moment wherein nobody noticed, and quietly slipped out, not wishing to offend. My good friend, the Gaon, Rav Shea Hecht also has Yohr Tzeit around this time after his father R’ Peretz, and we shared much of the previous year at Ohel Devora in Melbourne saying Kaddish for our fathers. I had heard that Reb Shea was “around” and wanted to say Good Shabbos to him before I headed off to Getzel’s Shule for the Kiddusha Rabba. Someone advised me that he was in “that room” on the right, just down the hallway, otherwise known as the Cheder Sheni. I popped my head in and saw Shea and he greeted me warmly. As is his ebullient way, he introduced me to a packed room of people in the middle of a Kiddush, packed on benches like sardines. Suddenly a colourful character named “Pinto” began speaking in a loud and boisterous and voice, challenging aspects of my views on various matters with a smile. This didn’t bother me, of course. Pinto was clearly refreshed and in a happy mood. I like happy people, as long as they haven’t left their brains parked at home, or don’t have any to find. The next thing I knew, I was “magically” propelled onto one of the benkalach among this group of what I now know to be seasoned kiddush machers. They were generally my age and older and were a jolly group for whom opinion flowed with un-alarming alacrity. They insisted I should make Kiddush as this was the real Kiddush. Pleas that I needed to go to attend a Kiddush for a Simcha seemed to be irrelevant. Nu, so you will go after this kiddush. I don’t dislike white liquid, but suggested that the cup they had given me was three times the Shiur of the Chazon Ish, let alone R’ Chaim Naeh, and a usual 80-100ml cup would be plenty. Plastic sufficed, I didn’t follow Poskim who held you needed a more substantial material for a cup. Immediately, a cup of appropriate size was placed in front of me, brimming with “lighter fluid”, and I made Kiddush. well if that’s how you feel, you davka are the type of person who should go. I was to discover that the “Vodka” I had consumed a number of subsequent times included the famed “Zeks und Ninetziger”, otherwise known as rocket fuel. My Zeyda Yitzchok after whom I was named, drank Zeks und Ninetziger every Shabbos, and I knew the secret was to pour and not allow it to touch the extremeties of one’s mouth. My father used to mention this to me. Unsurprisingly, I don’t remember the details of conversations. Nu, what time tomorrow shall I pick you up to go to the Ohel. I hadn’t even agreed to do so let alone committed to such after Rabbi Kotlarky’s talk on that topic. By that stage, I felt somewhat “worn down”, and his ehrlichkeit penetrated. Knowing that we had lots to do on Sunday (including catching a flight later to Montreal), I thought I’d say 7am sharp, and this would surely prove to be too early for my interlocutor. He asked me where I was staying, and promised he’d be there at 7am. I had no contact number, and at that stage didn’t even know his surname. I didn’t know whether he was serious or not, but he was rather heartzig (heartfelt) and earnest and seemed to ooze chesed (kindness), so I took him at face value. As I found out later, he was married to a lady I saw on our first evening in Crown Heights and whom I mistook for our good friend in Melbourne. Her mode of speaking and voice are almost identical and I had met a few years prior in Melbourne on Chanuka. Everyone seemed to know him and warmed to him, seemingly magnetically. 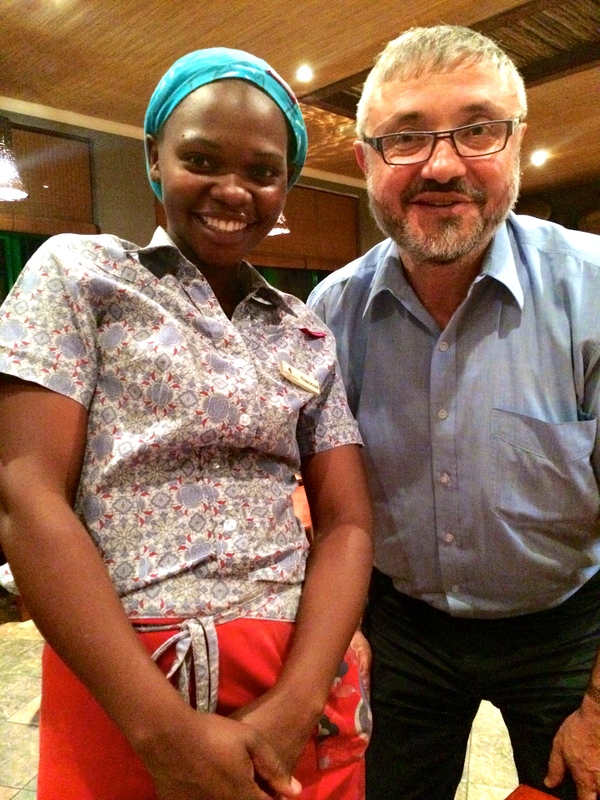 Moshe was very kind, and looked after me (I would have been lost without him, having no spatial skills whatsoever. Eventually we both finally made it to Getzel’s Shule for the Kiddush). I sensed the host would would have liked me to have come earlier, and he was very right. I still managed a L’Chaim or two. Thankfully I had davened Mincha at 770 beforehand. as if I had been with the King of England. I woke on time, and sure enough, Moshe was also there on time. I had my Tallis and Tefillin and didn’t know if we’d daven before or after the visit to the ציון of the Rebbes. On the way we spoke, and although he was rather Russian, and I was an Aussie academic whose מהות (soul) was still planted in Rawa Mazowiecka, Poland, we had a curiously common language and got on very well. He kept saying I was “funny”. I don’t know what that meant, but I assume it meant that I was somewhat more unpredictable with my responses than he was used to. When we arrived at Montefiore Cemetery, I didn’t know what to expect. We walked through a front door, and were confronted by the video of a past Sicha on a big screen. Somewhat fortuitously, sitting to the right and behind the Lubavitcher Rebbe in a light suit, was Reb Yisroel New (whom I knew, as a great-grandfather of the Chosson). The topic was “holidays”. and the LR was fulminating that there could not be a holiday from Torah and that he couldn’t understand how Mosdos would close down completely. I was on holiday, but I didn’t feel I had stopped my small engagement with Torah, so took his words in context. Moshe stood there and listened באימה, and I didn’t move until he moved on. At every stage, everyone seemed to greet him with warmth, and I realised he was a real personality amongst the populace. We moved into a large room where minyanim were taking place (and apparently a Bar Mitzvah was being prepared for) and then suddenly I came to a door. I opened the door and tentatively entered and was confronted by the scene of two stark Matzeyvos filled with mounds of torn paper. I physically recoiled backwards. This was my natural reaction as a Cohen. Although there was a mechitzah around the Kvorim, it was not natural for me to be so close, and my Cohanic instincts made me take two backward steps. I had the Maaneh Loshon with me, and after staring at the graves and scrutinising the words, noting the slight difference in language, my mind wandered to the contribution and responsibility these two Rebbes had played in my life, overseeing and supervising the establishment of the School that I was to attend for 12 years. People around me were saying Tehillim, and one lady was weeping audibly. Rain was dripping on my hat and Moshe was saying Tehillim. I didn’t write any note, nor did I take off my shoes or knock at the door. I didn’t feel disrespectful. Eventually I started saying the Maaneh Loshon, but the words were floating around on the page, and I can’t say that they were at one with my mind and thoughts. I subconsciously decided that silent contemplation with my eyes shut was appropriate. It required great concentration not to commune directly with the Rebbes. I concentrated on asking their Neshomos to join me in beseeching Hashem for various things relating to others. Only at the end, did I venture into a short matter about me. I’m not sure how long I was standing there for, but was to learn that Moshe went 2 or 3 times a week, and normally said the entire Tehillim. I felt a little guilty, when after some time I felt I had ended my experience and tentatively started to leave. Moshe compromised his usual timing and joined me immediately. This was something I learned later. I was amazed at the “celebrity status”. He asked someone walking along the muddy path if they needed a lift, and we drove back. He had no airs or graces. I see you seem to have found a soul mate. I responded that we had a natural affinity to each other and could have spoken for another two hours without a problem, even though externally we are chalk and cheese. Later, people told me about amazing acts of Chesed that Moshe was doing for many people, and I was not surprised. It was only then that I realised that Moshe and his wife were actually the bookends of our visit to crown heights: His wife when we arrived and Moshe when we left. On my return, I obtained Moshe’s number and sent him a proper thank you. Should I return to Crown Heights, I will definitely seek him out. He helped make my visit to the ציונים of the Rebbes less stressful and dignified, and without pressure to conform in any way. Uncle Pinye was another long-time member of Elwood Shule after his family moved from Adelaide to Melbourne. He sat at the back-most row of the Shule in the last seat of the middle section on the left, leading into the Beis Medrash named after R’ Chaim Yoffe, where daily services are still conducted. Uncle Pinye didn’t sit there because the seats were cheaper. He sat there because he was enigmatic. On the one hand, he wasn’t short of a dollar, and was munificent when it came to Tzedoko for causes that were dear to him. He revelled in the happy social murmur pervading a brunch or event that he loved to host. On the other hand, he wasn’t a person who felt comfortable “standing out” in a Shule environment. The most comforting, perhaps compromising position for him was in the back row. If anything, I felt that he was always struggling when sitting in Shule, conjoined to a seat. To be sure, there were other members of our family who also sat in that back row over the years, and this would also have contributed to feelings of relative comfort. I use the term ‘relative comfort’ because he was constantly in a state of inner and vocal philosophical turmoil. All Holocaust survivors struggle to find meaning or justification (if I can use such a word) to describe what they experienced, but he was an Auschwitz survivor whose tattooed number one didn’t need to see. ‘Holocaust survivor and State of Israel lover‘ were evident in a virtual tattoo that was visible constantly on his forehead and literally manifested itself in every second line of conversation I and others had with him for almost 50 years. A close friend of my father ע’’ה for seventy years, he and his wife Resi ע’’ה loved my mother equally. “Why me? Why did I deserve to survive? What inherent quality did I possess that was not possessed by the millions who were butchered around me? Hey youngster! Yitzchik, I know you are an intelligent boy, a religious boy, and a good son to your parents, but one day I’d like you to explain to me why 1,000,000 children deserved to die. As I got older, and wiser, I subconsciously, and no doubt intentionally, tried to gently steer the conversation away from that and to the Nachas he was enjoying. He wasn’t simple, of course. He knew exactly what I was doing, and sometimes managed to reverse my strategy. He wore a small Tallis, and usually that grey hat. I suspect that the late and great R’ Chaim Gutnick ז’’ל was someone whose expressed the pain of the holocaust and a genuine love of the State of Israel as manifested in his renowned drashos, affected Uncle Pinye in a manner that captivated his attention. Rabbi Gutnick didn’t have answers either. He never pretended to. Who does? He spoke about the dry bones, and how those dry bones came to life. I am sure that message resonated somewhat with Uncle Pinye, and it was probably for that reason, and the cajoling of my father and late Uncle Yaakov, that allowed him to feel semi-comfortable enough to attend Elwood in those days. Listen to me youngster (he was 93 and I have grandchildren!) I do not intend to leave this world until I get an answer to why 1,000,000 children were allowed to be murdered. I was frozen, as always when confronted with this style of questioning. I find it difficult to read books about the holocaust, let alone watch a movie. The latter stems from my experience as a boy, watching the Diary of Anne Frank and running out of the TV room when the Nazis ימ’’ש found her. I recall running to my room in Rockbrook Road, lying down on the bed, trembling and weeping. I don’t think I’ve ever recovered from that moment. But, this isn’t about me. When we were young, his family lived in Adelaide. It was there that he built his livelihood. They would come (and it wasn’t cheap) for visits to Melbourne, and there was no question that his daughters were tantalised by the richer Jewish and social life in Melbourne, as well as the sense of family experienced through the wider Balbin family. Whenever they came, we were in their surrounds, enjoying many moments together. They were a permanent fixture though they lived in Adelaide. Eventually, daughters Dora and Belinda won. The family moved to Melbourne, but he used to commute because he couldn’t just leave his business interests to dissipate in wanton abandon. still rings in my ear. It wasn’t an offer. It was essentially a command. He had it all behind that bar, and once a drink or two were quaffed, our discussion inevitably led to the Holocaust and how much he admired my parents and family. 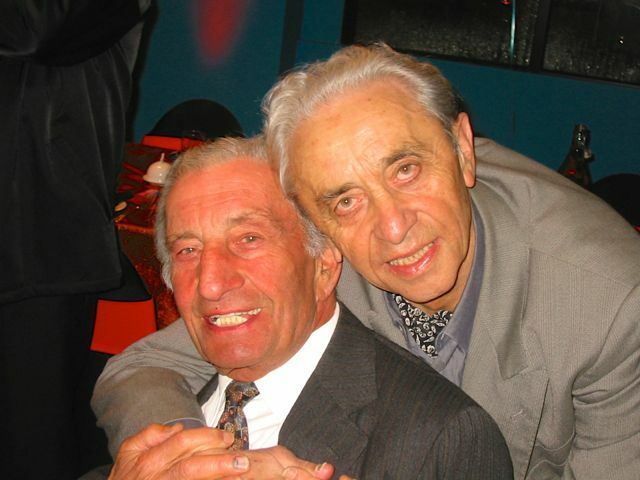 He would enthuse that he didn’t have words for the honesty and integrity of my father and Uncle Yaakov who slaved upstairs in their factory cutting clothes and assembling them for production. For her part, my mother knew that Uncle Pinye loved Choolent. Almost each Shabbos, especially when my father retired, we set aside the remainder to be delivered personally by my father (sometimes together with me) to his house on Sunday. If my father was ill, he and my mother would ask me to perform the delivery. I did so, willingly, of course, even if it meant a drink and talk session that lasted at least an hour. There was no such thing as a quick visit. I remember a number of times he said to me, “Yitzchik, I have so many paintings, please choose a few and take them home for your lovely wife”. I have always felt uncomforable accepting gifts, and I kept replying that I had no art appreciation and he’d need to talk to my wife. His response was, of course, “so bring her, with pleasure”. My wife also visited on a number of occasions and he loved her too like family. when he imagined that nobody had survived, he found two of his sisters in my Booba and Zeyda’s house in Rawa. He never forgot that. I recall when the sisters (Zosia and Itka), who lived overseas, would come to Melbourne, the special bond that they too shared with my father. The kinsmanship and love were palpable. It was no problem for me to like them as well. It was a veritable hand in glove. Like my parents, his family was his love and purpose and that kept a tortured soul focussed and grounded somewhat. The State of Israel was a miracle he was so very proud of and he never failed to be part of it, even when he wasn’t physically standing in the streets therein. When my father ע’’ה passed away recently, he turned his attention to the isolation and melancholy that my mother understandably descended into. After her serious fall, he redoubled his efforts, even though he was physically frail. Almost a day wouldn’t go by without him incessantly ringing my mother, and then me and my sisters when he couldn’t elicit an answer from her phone. He wanted to take out the entire family for dinner. I tried to explain that we’d need to wait until the year was over, and he accepted that, but even after the year was over, my mother was and remains rather isolationist, rejecting invitations from her friends for the most simple of activities, such as sharing a cup of coffee. This will change, undoubtedly, in time, but alas, Uncle Pinye departed before she was able to bring herself to accept invitations with comfort. The hidden mysteries are the domain of Hashem, but the revealed, is for us, our children and offspring, forever. This is my only response, although it is not one that I ever used in discussion with Uncle Pinye. There could never be a response that would assuage his troubled, quixotic character. He is now hovering above his grave on the journey to the Garden of Eden, at the end of the 12 months of mourning. His legacy, kindness, love, and gregarious nature, though, is set in stone in my psyche, and in that of my mother, siblings, children and the wider Balbin family. Postscript: at great expense and with much paper shuffling under the devoted hand of Ezra May, he decided to formally change his name back to Koplowicz. 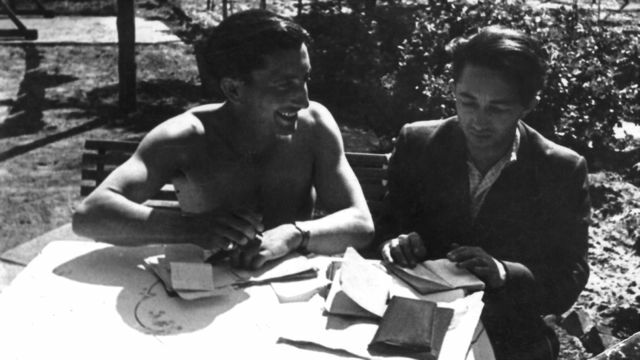 He had needed to function as “Kay” but he had never lost the Koplowicz, and that describes his essence in a single act. It isn’t surprising that Yom Yerushalayim will fall during his week of Shiva. That is also Hashgocho—the conundrum of issuing praise for the miracles Hashem wrought after the Holocaust, davka at a time of extreme mourning for an individual of this ilk. The Heimlich family is an honourable family in Adass Yisrael, full of Talmidei Chachomim, born and bred in the Charedi (hungarian) community in Melbourne, Australia. 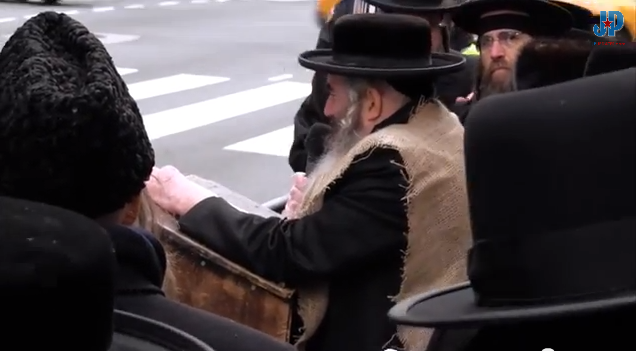 One of the sons, is a renowned Posek to whom most Adass folk turn to for their Sheylos today. He sits in the Gerrer Shitibel daily and learns, and is a fine man. One brother Nachum is a Rosh Kollel in Satmar. You can hear his vituperative and spite filled anti zionist/jewish speech on youtube, where he tells the non Jews that we don’t need a country, we don’t need an army etc and publicly criticises Israel. To Nachum I say, come back to Australia. Your place isn’t in Israel. Why torture yourself by staying there. Pull out, I say. Get your kinsman out of Israel. Cross the border into Ramallah. Go live there in peace and harmony. Get the heck out of Israel. It’s really Avi Avos HaTumah for you and means nothing to you. Get lost! Shame on you Rabbi Nochum Tzvi Heimlich on the youtube (listen at about 10:42) The Australian accent is unmistakeable. What a Chillul Hashem. Remove your sackcloth, and come wear Australian sheepskin. I call on his brother in Melbourne to condemn his statements. I doubt it will happen any more than the clandestine visits of Rabbi Beck to his infamous extremist brother. We in Melbourne are fools for supporting and allowing these extremist elements to take our money through their various businesses. Next time you deal with one, ask him whether he supports Satmar and Toldos Aron or similar. This is a Shandeh. I call on Adass to distance itself explicitly in the press from these extremists and condemn them and their sentiments. The Mizrachi Organisation is to be congratulated and commended for the incredible amount of time and money that they have put into Kashrus in Australia. Starting from מורי ורבי, Rav Abaranok ז’ל the move over time to align standards with the world respected and renowned OU is something we should all celebrate and not criticise. Rabbi Mordechai Gutnick, and his team, of late, together with the lay committee are responsible for the thick booklet we now have. It is true that life would be a lot easier if all Australian products had a Universal Symbol for Kashrus, and if the Sydney Kashrus Authority also adopted the OU standards across the board. 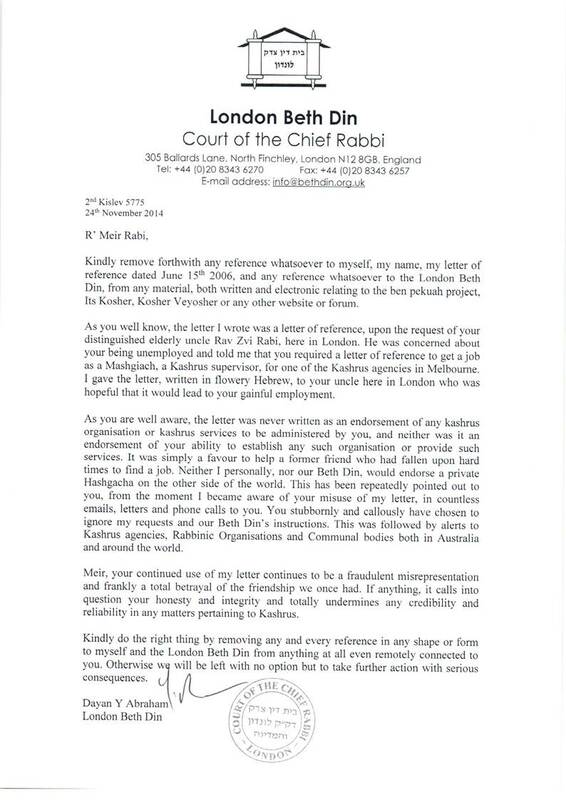 My feeling is, and I haven’t discussed this with Rabbi Moshe Gutnick and could be completely wrong, that Sydney tend to adopt the standards of the London Beth Din. These are legitimate, of course, but, to me, the OU is the best hechsher in the world. To appreciate the quality of OU, one only needs to listen to the OU Kashrus Q and A videos from both Poskim, Rav Hershel Schachter and Rav Yisroel Belsky and listen to the array of shiurim from the Kashrus experts across a wide array of issues. I have spoken to both Poskim in the past, and I am in awe of their ידיעת התורה (knowledge of Torah). In the case of Rav Schachter (only because I have had a little more interaction and listen to his shiurim regularly) his גדלות in מדות טובות (moral fibre) is also inspiring. Rav Schachter is eminently approachable. It is one of my disappointments that nobody sponsors a Kollel Week of nightly Shiurim in Melbourne with someone like a Rav Schachter. Chabad, understandably invite their own, and I don’t even know if Beis HaTalmud does these sorts of things much since Rabbi Nojowitz departed and the new regime took over. Any גבירים (financially comfortable people) out there want to sponsor something like this? Melbourne would be bedazzled by the Halachic clarity that Rav Schachter transmits. He isn’t the only one, of course. I’d be equally happy to hear Rav Zalman Nechemia Goldberg or Rav Usher Weiss. The latter travels to South Africa and the States quite often for lectures. I have also spoken with Rav Usher Weiss, and he too is an עניו (humble) and a גדול בתורה (great knowledge of Torah) who is most unassuming. I’d say he is less likely though to stand out on some issues, even though his analysis often makes you think he thinks something is indeed מותר (permitted) when he finally paskens it’s אסור (forbidden). Rav Schachter, however, seems to have a more Brisker approach to Psak and concludes according to his understanding: for example, he has said that showering on Yom Tov is permitted (albeit not using very hot water), something I have personally felt was מותר for over 30 years, but I am digressing (as usual). I was a fill in representative for Elwood Shule many moons ago at the Council of Orthodox Synagogues of Victoria. The topic of the then Mizrachi Kashrus arose. Indeed, it was brought to the table by Mizrachi. There was also a prior proposal around the same time, I believe it may have even been authored by (now) Adjunct Professor Harry Reicher, then of Melbourne, where the lay body was to take over the financial and administrative oversight of kashrus, beis din and involve all groups (even Adass). Without going into the details of the plan, I clearly recall the Mizrachi delegate, Mr John Kraus, speak to details depicting the financial loss incurred by the Mizrachi Organisation in continuing to run Kashrus. He was very keen for the COSV to take over. The COSV debated the issue, did its sums, and came back with a positive response. I remember feeling that this was going to be a momentous outcome for the community. Why, indeed, should Mizrachi have to bear the burden? Inexplicably, just as the “deal was to be done”, Mr Kraus returned to the COSV and suddenly and surprisingly announced that Mizrachi had withdrawn the offer and would continue to oversee the operation. I am not privy to Mizrachi’s thinking at that point. I don’t see Adass as a practical partner in any future Kashrus organisation or Beth Din or anything of that sort. They are separatist, and have a right to stay that way. They don’t change. They are effectively a hamlet and organisation to themselves. Each to their own. All non Adass shules, including Shteiblach and the like, should join the COSV and pay dues. There is an important role for a COSV and it’s not satisfactory that some congregations contribute, while others do not. My brother-in-law, Romy Leibler, did a great job reforming the lay (financial) arm of the Beth Din together with Meir Shlomo Kluwgant. I think it’s way past the time for the COSV to do the same through quiet diplomacy with Mizrachi. Melbourne will grow when this happens. In my opinion, such a move is more important than dealing with alternative, and so deemed “enlightened” kashrus supervision that we have seen sprouting lately and which is diverting us from the main game of communal accountability and reform. PS. Some of you may know that there is an esteemed Kashrus Organisation called the cRc (Chicago Rabbinic Council), which is headed by the respected Av Beis Din of the Beth Din of America, Rav Gedalya Dov Schwartz. They were in the press recently with their analysis of the Kashrus of Starbucks. On Pesach, you may have notice another organisation, who name themselves CRC (Central Rabbinic Congress which I think is more than cheeky), who approve various products, including the “Glicks” line of products from overseas. CRC is not cRc. CRC is affiliated with Satmar and the Eida Charedis. They feature, infamously, on this page under Jews against Zionism. Pick your products in my view. If I have a choice, I will always use OU and avoid the anti zionist Eida Charedis and their ilk.